ERISA imposes complex responsibilities and restrictions on fiduciaries of employee benefit plans, and sets standards for the operation of plans and investment of plan assets. It also establishes bonding and reporting and disclosure requirements for employee benefit plans and their fiduciaries. 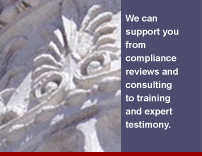 Through compliance reviews and fiduciary liability audits, we can assist plans in complying with all aspects of ERISA. A compliance review and a fiduciary liability audit are similar in focus, but different in scope. The fiduciary liability audit is more comprehensive than the compliance review. It includes larger samples of transactions and service providers, which are analyzed and reviewed for compliance with ERISA and the Internal Revenue Code. ERISA Consulting Group recommends that a compliance review be conducted for all plans every year and a fiduciary liability audit be conducted every three years. After a compliance review or fiduciary liability audit is completed, ERISA Consulting Group provides a full written report on the review or audit findings and provides recommendations to correct any deficiencies in the operation of the plan. There are important reasons to focus on ERISA's reporting and disclosure and fiduciary standards set forth in Parts 1 and 4 of Title I of ERISA. Those sections govern plan trustees, service providers, and administrators in their most common and important duties with employee benefit plans. Experience has demonstrated that non-compliance with Parts 1 and 4 is the cause of greatest monetary loss to employee benefit plans, and is the most frequent cause of time-consuming and costly participant, beneficiary, and government civil and criminal litigation involving benefit plans and their fiduciaries. Not surprisingly, a plan's compliance with Parts 1 and 4 is the most heavily audited and investigated areas for Department of Labor and Internal Revenue Service representatives charged with enforcing Internal Revenue Code and ERISA requirements through on-site audits and investigations of employee benefit plans. The compliance review and fiduciary liability audit are not a substitute for the independent qualified public accountant annual audit required for many employee benefit plans. The compliance review or fiduciary liability audit and independent qualified accountant audit are qualitatively different. Generally, the independent accountant's audit is not designed to meet the Department of Labor or Internal Revenue Service audit and investigative standards. The compliance review and fiduciary liability audit provide an opportunity to review the performance of selected service providers (accountants, third party administrators, investment advisors, actuaries, etc.) and ensure that the plan is receiving the most appropriate and highest quality services for the cost. In addition, the review and audit allow plan fiduciaries to evaluate the adequacy of internal plan controls. In the event violations are uncovered, the compliance review and fiduciary liability audit allow fiduciaries and their attorneys to determine, in the first instance, the best remedy for correcting violations and limiting plan asset losses. The review and audit also allow fiduciaries to avoid or mitigate any adverse publicity. If no significant problems are discovered, the compliance review and fiduciary liability audit give assurance that plan operations are sound and provide a potential defense against unfounded charges relating to a lack of due diligence in the performance of fiduciary duties. - Issue a final written report to plan counsel, or to the trustees, as directed. The final written compliance review or fiduciary liability audit report will be delivered only after a draft report is discussed with plan counsel or trustees. Typically, a compliance review requires four to six weeks to complete. A fiduciary liability audit generally requires six to eight weeks to complete. ERISA Consulting Group specializes in correcting violations before the Department of Labor or the Internal Revenue Service discover them. Discovery of violations before a government audit or investigation provides important options on how best to correct violations. Proper correction of violations limits investment losses, lawsuits, and government penalties. Correction of violations also reduces the likelihood that the Internal Revenue Service will take steps to disqualify a plan. In the event the Department of Labor or Internal Revenue Service has initiated an investigation or audit, ERISA Consulting Group has the expertise to limit exposure to liability and reduce costs associated with an investigation or audit. Working with plan counsel, we can insure that unnecessary corrective action is avoided and improper penalties are not assessed. Get the support you need to comply with the law and properly administer all aspects of employee benefit plans. Get the necessary support when faced with litigation or the potential for litigation. We provide expert testimony regarding investment transactions, plan administration and operations, remedies available under ERISA, and other aspects of ERISA compliance. Resolve fiduciary and administrative issues outside arbitration or litigation.